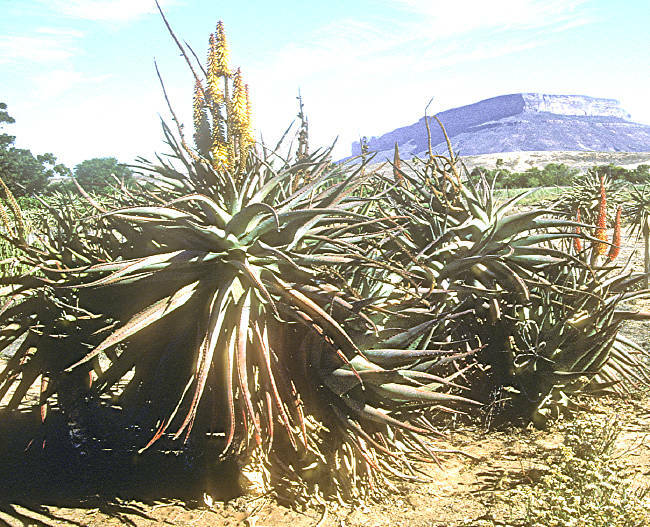 Aloe ferox is a tall, single stemmed Aloe up to 10 ft tall with a wide distribution in the South African Cape, Southern KwaZulu-Natal, Lesotho and the Free State, in grasslands and bush in both Summer and Winter rainfall areas. The large 3ft, tapering, fleshy, grey-green succulent leaves with reddish-brown toothed margins are arranged in a dense rosette. 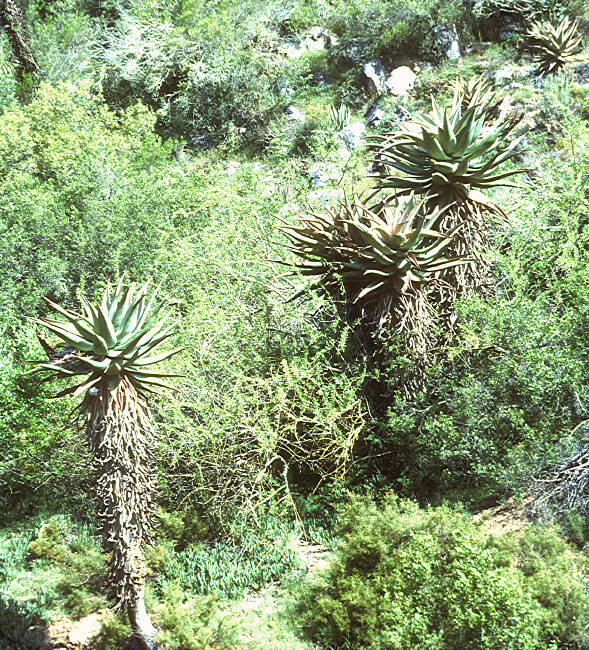 Teeth may be present on the leaf surfaces, especially in immature plants. Old leaves remain as protective felting on the stem, leading to a rather untidy appearance. The flowers in various shades of orange are carried well above the leaves on candelabra-like heads with up to ten dense flower spikes. Copious production of nectar makes the flowers attractive to birds, insects and monkeys. 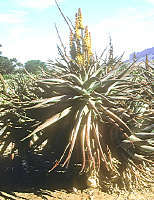 Aloe ferox is the source of "Bitter Aloes," the yellow juice from just under the skin, which is a powerful purgative. The gel within the middle of the succulent leaves has similar soothing properties to that of A. vera. 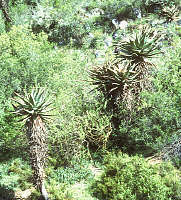 Aloe ferox is an impressive feature plant for a Mediterranean climate, or as a container plant if it can be given Winter protection. However it is grown, it needs full sun and free-draining soil to prosper. 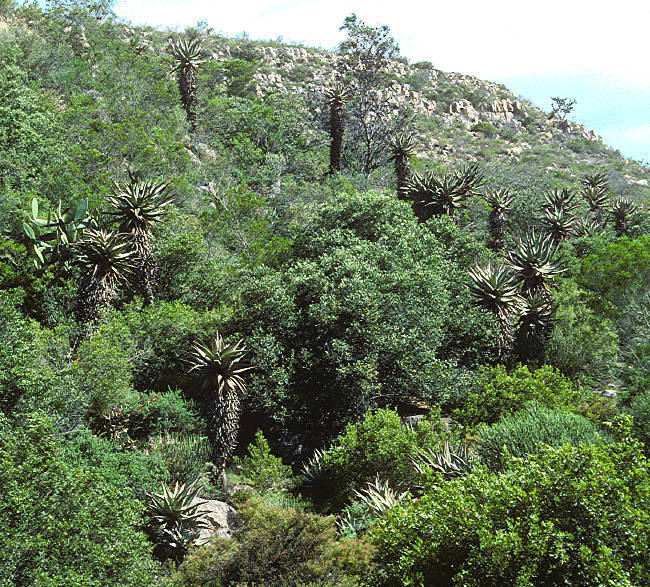 Left: Aloe ferox on typical habitat of rocky slopes, near Robertson, RSA. Xmas 1998. Note large invasive Opuntia sp. middle left.